This post has been planned for years I’ve just always put off writing it. As much as I like writing reviews, looking at a massive stack of books and trying to write intelligently about them is pretty intimidating. But I was determined to get it done, and I have! And just in time for the holiday season! I hope this is helpful for anyone looking to buy books, or if you’re just curious about the books I reference when making costume! I have two disclaimers before getting started. Firstly, I do not own the rights to any of these works. The copyright for each book belongs to the authors, publishers, and contributors, not me. In this post I’ve included two pages from the interior of each book which I believe falls under fair use. The photos are sized down or taken from angles where the pages aren’t usable for anything other than understanding the format of each book. They are not intended to harm the commercial value of the books. But I’ll happily take down any of the images if the copyright holders ask. And the second: The links in this post are amazon affiliate links. This means if you buy something through the links I get paid small percentage of the purchase price for referring you to that item. It doesn’t change the price of the item, or the shopping experience at all. But if you’re uncomfortable with this the links should be avoided. I’ll start with some of the most popular, which also happen to be the first historical fashion books I got. They are a series of books called “Patterns of Fashion” which were written by Janet Arnold. There are four books in the series and I own three. This book focuses on women’s fashion from the 1660’s through the 1860’s. It’s primarily a pattern book but starts off with a fifteen page introduction, which includes quotes from magazines and journals, very brief drafting instructions, notes on how to cut dresses from limited fabric, and paragraphs devoted to things like making piping or pinked trim. I’m sure these notes are helpful for someone but I find them a little vague (and also confusing at times). But this isn’t why I bought the book, so I’m not bothered by it. I bought it for the patterns! 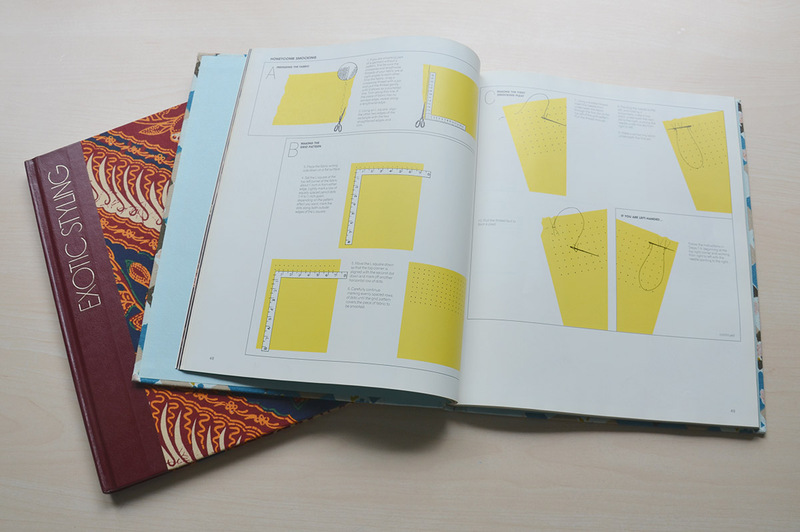 Unlike a lot of pattern books, this series includes detailed drawings of the completed piece from the front and back, and usually includes drawings of the interior as well. 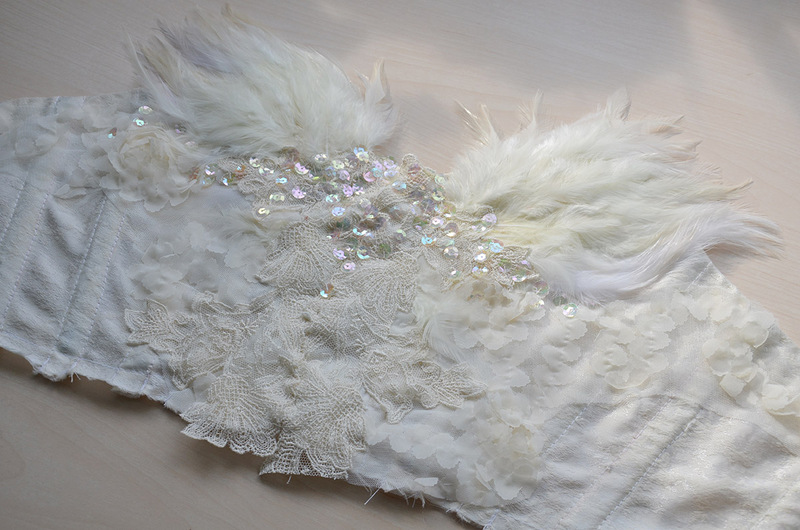 There is also a paragraph or two talking about the dress, including what it was originally made from and any unique construction notes. The patterns in this book are all made based on measurements taken from existing historical examples, so they are very accurate (as are the notes about each piece). 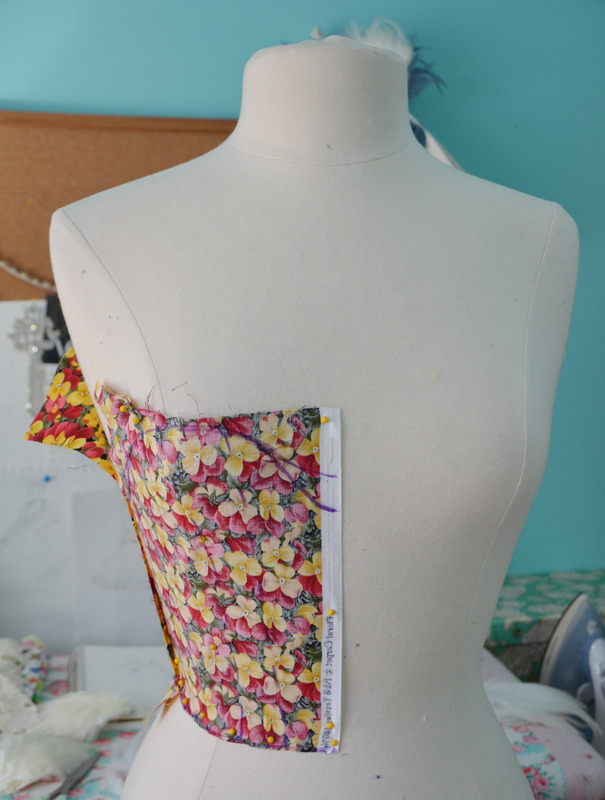 But keep in mind that these patterns will require scaling up, and alterations to fit your measurements. The patterns in this book are beautifully laid out. They are printed on a grid, which makes them easy to resize and they are filled with construction notes which make the intimidating and unusual nature of historical patterns a lot easier to tackle. The pattern notes are clear and concise – pretty much perfect in my mind! 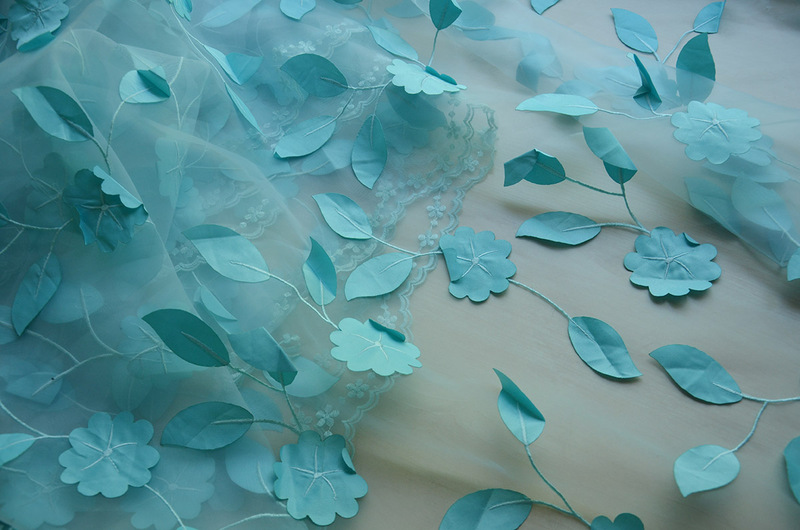 The patterns are also very detailed, with the trim placement and embroidery patterns documented as well. The only thing I don’t care for are the pieces chosen for the book. Some of them are quite similar. 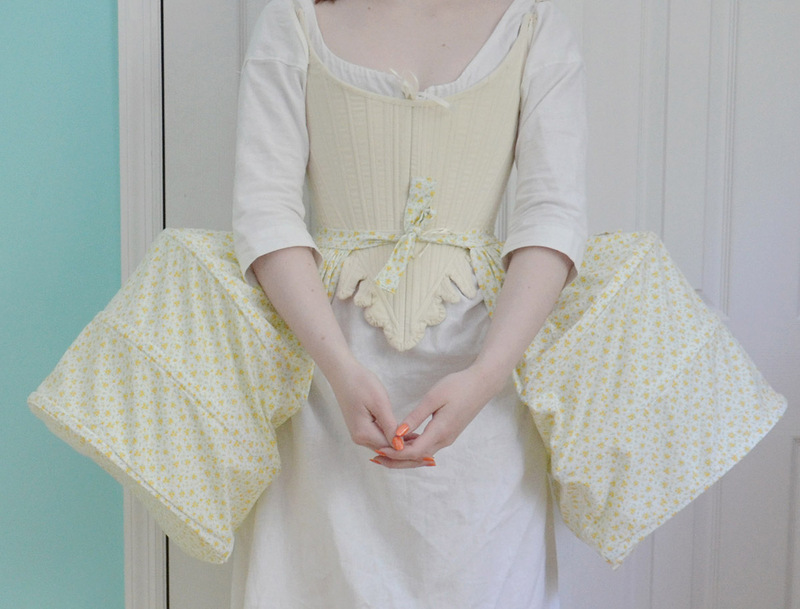 It’s especially obvious with the two 1840’s and 1860’s dresses which have very similar sleeves and tiered skirts. Compared to Norah Waugh’s books which have fewer patterns but a larger variety it’s a bit disappointing. I still think it’s worth it – over two dozens patterns for thirty dollars is a fantastic deal, even if you only use half of them. And the notes for each piece gave me a much better understanding of the construction progress for historical dresses. This book focuses on mens and women’s fashion from the 1560’s through the 1620’s. It’s twice the length of the first one, with a fifty page introduction. Luckily the introduction in this book is a lot more interesting. It’s filled with pictures and the writing compliments them nicely. The pictures range from patterns to etchings and paintings. 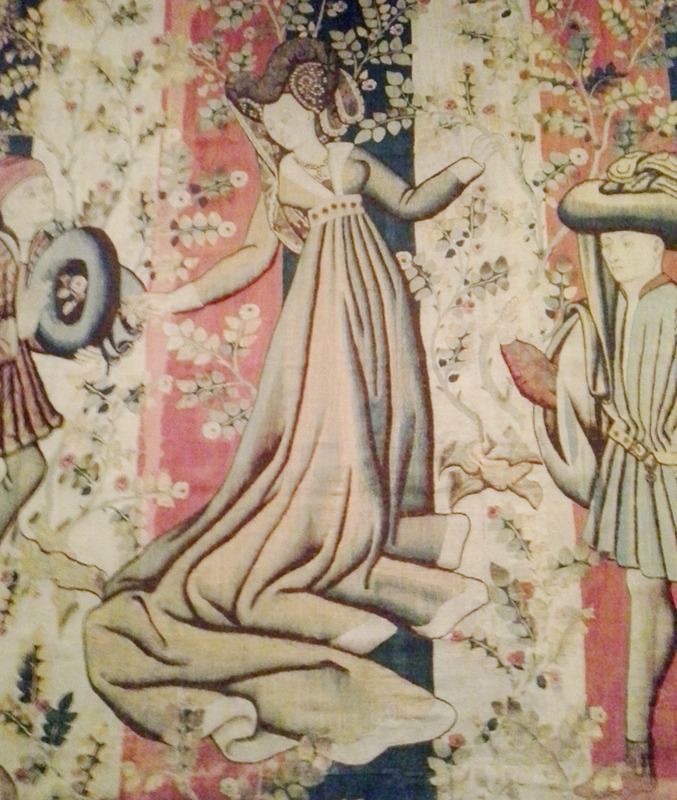 It also has a lot of photographs showing the details on original garments from the 1500s. It’s really interesting to see close ups of the fabric manipulation, closures, stitching, and lining techniques. Things you hear mentioned a lot in other books but never actually see. I’d say the book is worth looking through just for those images alone. The patterns in this book are documented in the same way as Patterns of Fashion 1. They are on a grid, with one page devoted to drawings of the finished garment and a brief description of the piece. The notes are just as helpful, and even more in depth since 16th century fashion was so complicated. The thing I don’t like about this book is, once again, the lack of variety. I believe there are twelve mens doublet patterns, half of which are pretty similar. 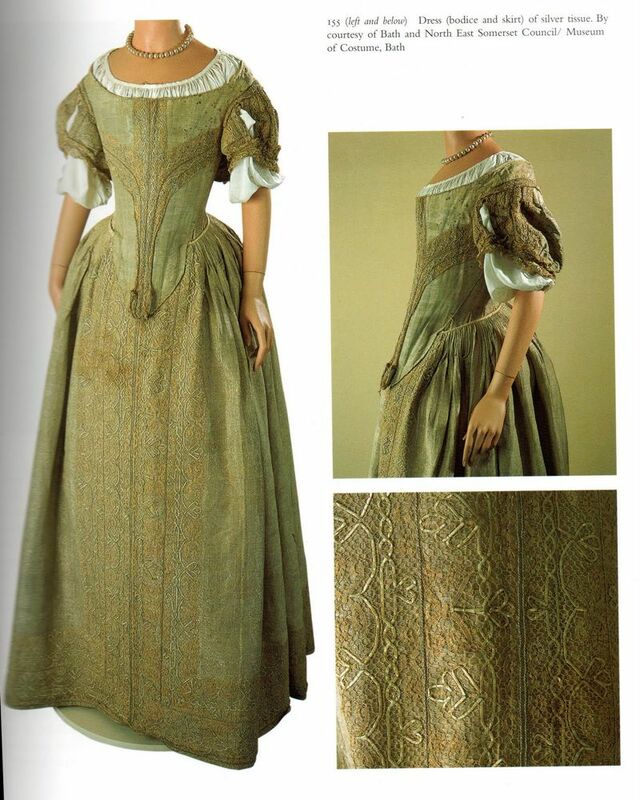 The variation in the women’s clothing patterns is good, but lacking some of the “classic” tudor styles. The examples are all very elaborate, which I find inspiring, but they are complicated and probably not the best for beginners. Like the first book, I think it’s a good deal and the notes are very helpful whether you’re using the patterns included or trying to draft your own in an accurate way. If you have an interest in the periods it covers I would highly recommend it. I regret buying this book. This isn’t a bad book by any means. In fact it’s really interesting to read through, and I’ve never seen anything like it before. It focuses on accessories and underpinnings for men and women, which isn’t the most exciting topic, but the introduction is filled with close ups of the detail work on garments from the 1500s and 1600s. 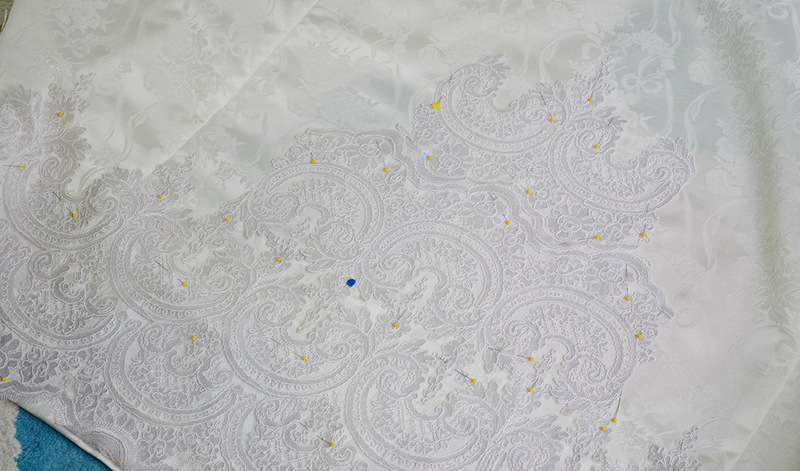 It has diagrams of the stitches used for openwork seams, eyelets, lace, and embroidery. It has pages devoted to the variety of cuffs that were worn, and another for collars. It’s fascinating to see that alongside photos of embroidery work done five hundred years ago. And like the last book, the photos are accompanied by descriptions. But the descriptions are a lot more brief, and the pages far more photo heavy than the previous book. The patterns are well documented, with drawings of the embroidery motifs and lace patterns in case you want to recreate them. The reason I regret buying this book is because I’m not at a point where I’m willing to spend forty hours adding blackwork embroidery to an undershirt. And even if I was, I feel like that information is available online. As far as the patterns go, I’ve never followed them. Because things like smocks and ruffs are very easy to draft on your own – they are just rectangles. There are a few patterns for gloves and collars that are unique, but also pretty easy to draft on your own or find elsewhere. I think this book is best for someone who wants to make exact historical replicas. Otherwise it probably won’t get a lot of use. I’m hoping to take advantage of the embroidery patterns someday, which is why I’ve held onto it, but this isn’t a book I feel I need in my collection. Another silly complaint which I have about all these books is that I don’t like the size of them. They are maybe 11″ x 16″, and since they are thin and paperback they don’t stand up, even if you lean them against something. And they take up a ton of room when laid out on a table. Plus the pages are too big to scan, which is sort of silly since that’s what you have to do to resize the patterns. Though it isn’t a deal breaker for me by any means, it’s kind of frustrating! This is a book I bought when making my Tudor Ensemble, since Patterns of Fashion 3 didn’t have quite what I was looking for and I was completely clueless about this period. This came highly recommended on every blog I read, so I decided to give it a try. To be honest, it isn’t my favorite book. Compared to other pattern books (like Janet Arnold’s and Norah Waugh’s) I find it uninspiring. 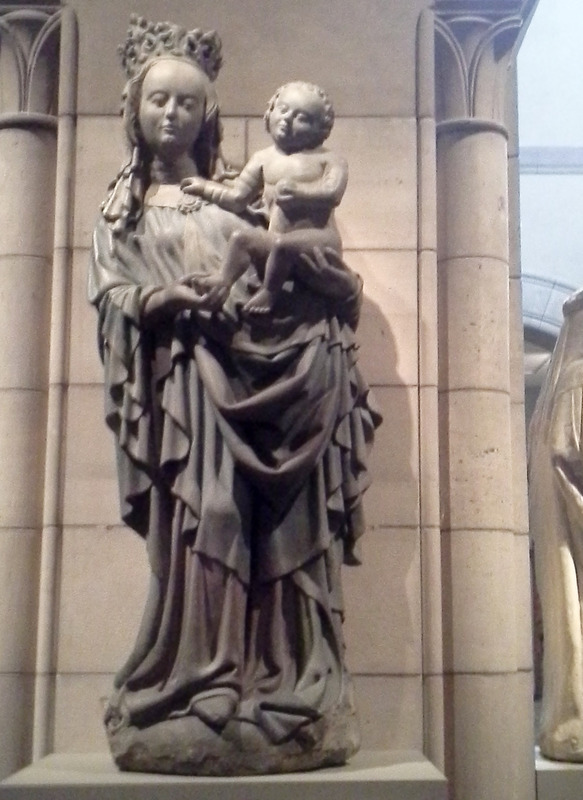 The patterns and examples all seem to be lacking the exaggeration and detail work that that period was famous for. I don’t want to make anything from the patterns since they seem lackluster, where with other books I want to make everything! But it isn’t a bad book! Much like the others it starts off with an introduction, except theirs is split into chapters. 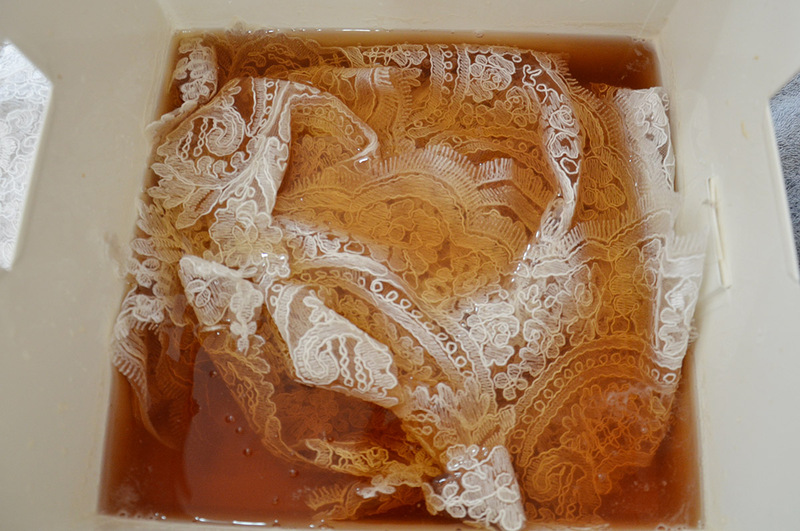 One of which focuses on the basics, another talks about the materials and dyes that were available, and another shows construction techniques. The pages are pretty dense, but it’s easy to read through and really interesting. The patterns each have one page devoted to assembly instructions, with a photo (or drawings) of the finished piece. 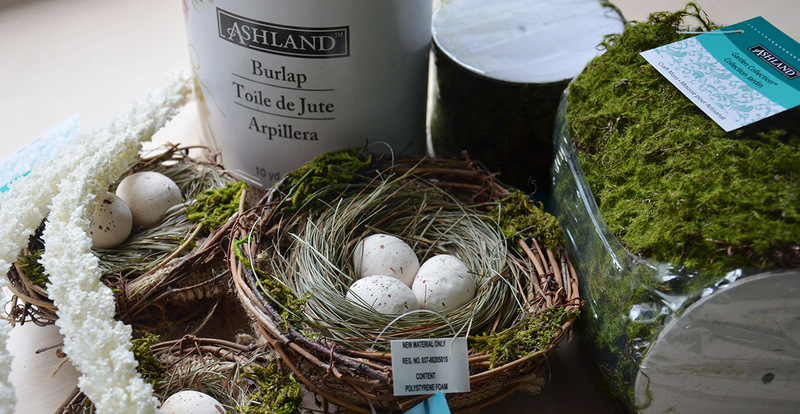 Each pattern has several variations, with the amount of material needed to make it listed. The patterns are also on a grid, which makes them easy to size up. I really appreciate the range in patterns – each one has a different silhouette, and they cover everything from dresses for the everyday tudor woman, to court gowns for the rich. 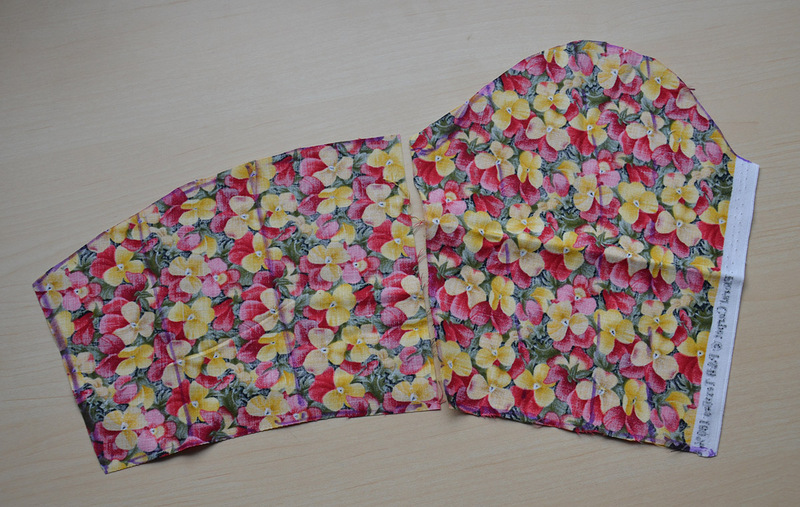 It has mens patterns too, patterns for foundation garments, and patterns for headpieces. I think this book would be good for beginners, since everything is much simpler than Janet Arnold’s, and it has more notes than Norah Waugh’s. If you find those patterns overwhelming, this is a better place to start. 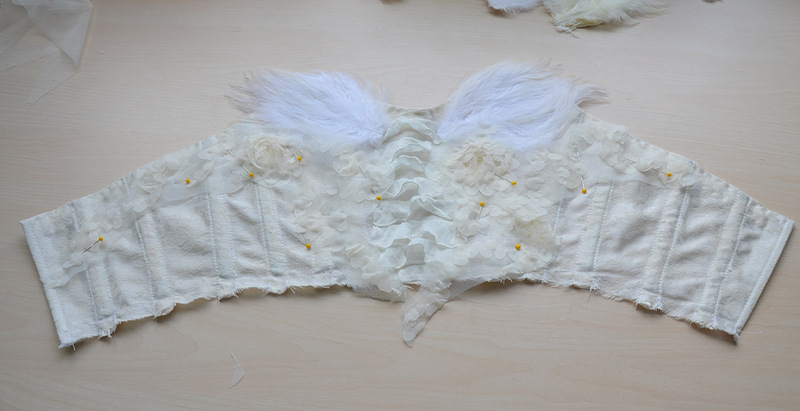 It’s also a lot more complete – you can make everything from foundation garments to accessories with it. But as I said, I find the patterns lacking the exaggeration and detail work that I like in patterns. 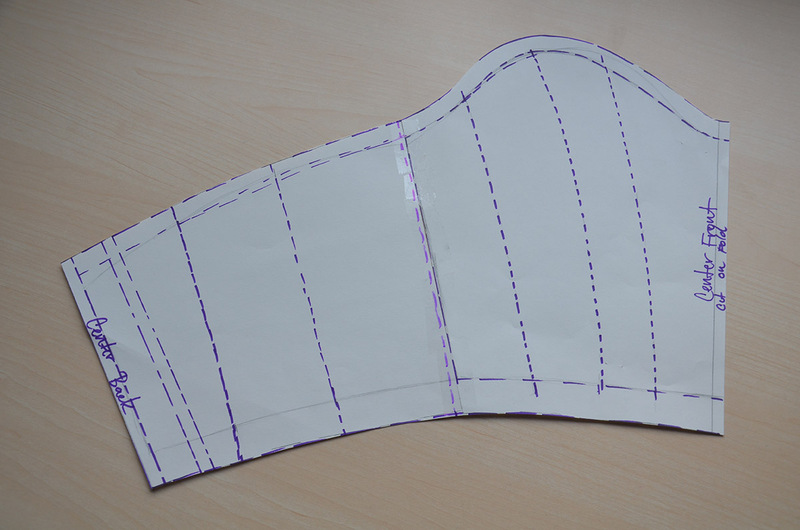 And for as simple as the patterns are, the lines are wobbly and the markings for pleats and boning are less clear. This is by far the most used pattern book I own. Every corset I’ve made has been based on patterns from this book in some way or another. Unlike the other books, there is no introduction. The book is split into chapters, with several dense pages of text between each pattern. This text doesn’t usually relate to the pattern, just the period that pattern is from. Some of the text is heavy, and since it was written seventy years ago it can seem a bit stiff. But I’ve read it pretty much cover to cover and enjoy how much information is packed into it, and how nicely it explains the transition between silhouettes and foundation garments. In addition to her own words, this book includes samples from journals and newspapers. Some of these are silly (and in another language) but it’s interesting hearing about the foundation garments from the perspective of people who wore them. The patterns are quite simple, made from a few pieces with only the boning placement marked. However the patterns aren’t on a grid, instead you use a key at the bottom of each page as a guide. 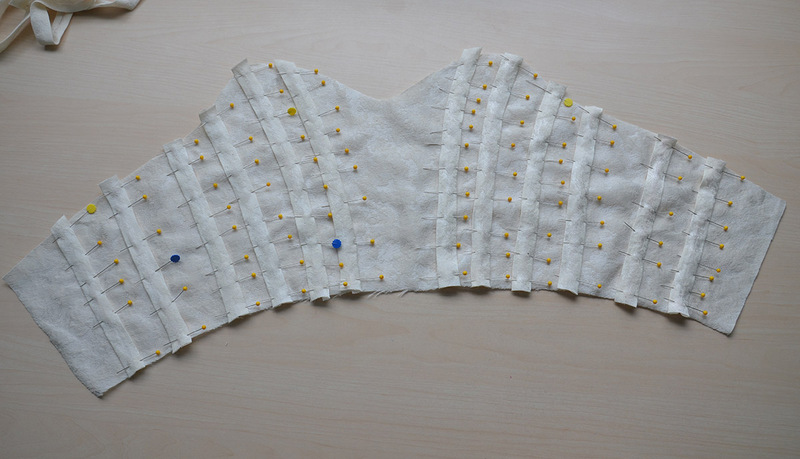 The patterns also lack notes, which isn’t a big issue since corsets are quite self explanatory, but it’s very problematic when recreating things from her other book “The Cut of Women’s Clothes: 1600-1930 “. Things like how the dresses close, and the order of assembly can be tricky to follow without anything but the pattern to go off of. In addition to patterns on bodies, stays, corsets, and girdles, this book also has patterns for hoop skirts, panniers, and petticoats. 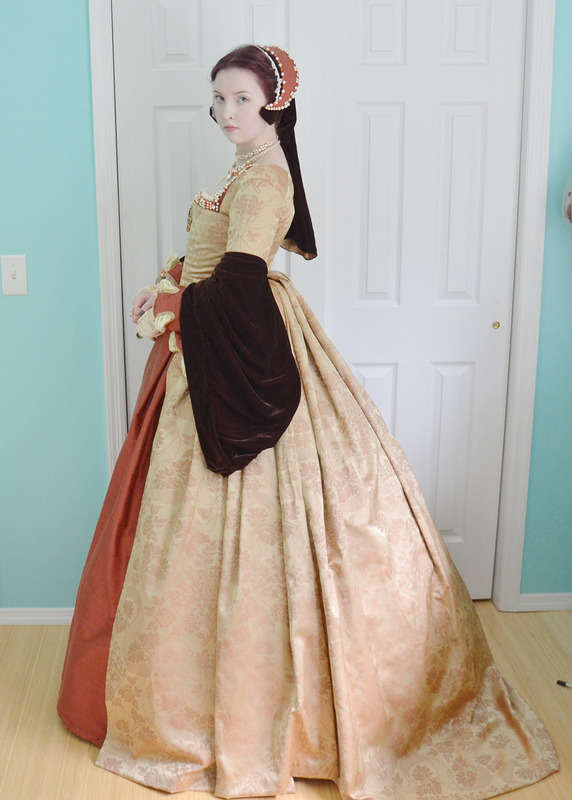 It’s incredibly helpful for creating the proper silhouette for historical costumes and I would highly recommend it – though once again, keep in mind that alterations will have to be made for the patterns to fit you. Norah Waugh has two other books, The Cut of Women’s Clothes: 1600-1930 and The Cut of Men’s Clothes: 1600-1900 . Though I don’t own either of these, I have followed patterns from the Women’s book and had the opportunity to look through it. I really enjoy the patterns included in this book since the variety is a lot greater than what’s in Janet Arnold’s, with patterns from the 1600s all the way to the mid 1900s. It covers a huge range of styles and silhouettes, and no two patterns are alike. As much as I like the patterns, as I said earlier, the lack of construction notes becomes a bit problematic with some of these patterns. They can usually be figured out with a bit of experimentation, but the way things are supposed to go together isn’t always clear since there are no notes. You’ve probably heard me talk about this book before, since I used it for three recent projects. It’s quickly become one of my favorites since I’m a bit enamored with the 1890’s, and this is one of the few books I’ve found that focuses on that period. This book has a single drawing of each finished garment, plus a paragraph long description of it. The garments are organized by date and season. Though it primarily has patterns on women’s fashion there are a dozen or so children’s patterns. I find a lot of the patterns to be quite similar, but there are subtle differences between them. And at the price point (twelve dollars or so) It’s easy to forgive. The patterns aren’t on a grid, and there isn’t a key that makes them easy to scale up. Instead the edges of each piece have measurements listed. The patterns do have errors that I’ve noticed, the most major being that they often use improper fractions like 3 7/4″ or 9 13/5″, which is confusing at times! Much like Waugh’s book, I wish the patterns had notes on them. 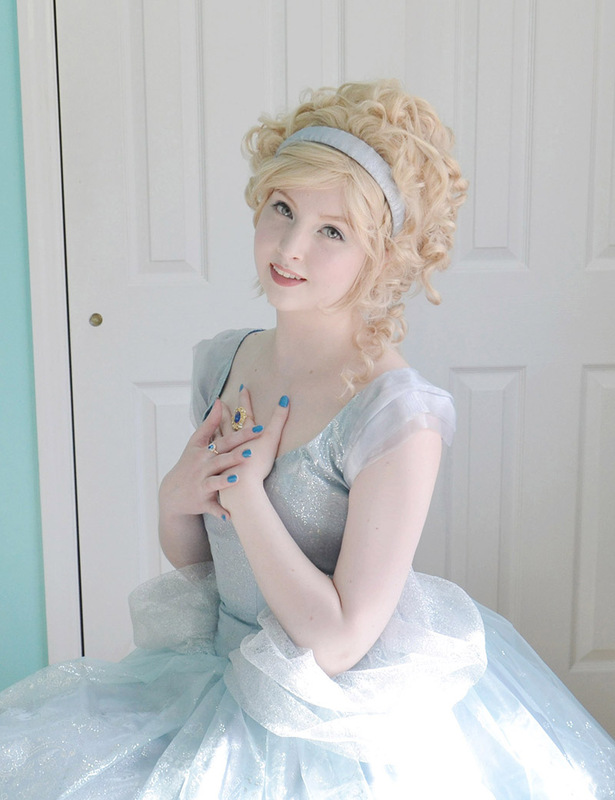 To create poofy sleeves and gathered bodices the lining often has a completely different shape than the fashion fabric that goes overtop of it. But it isn’t always clear how they go together. However I still really like this book. The variety in sleeve patterns is fantastic, and the skirt pattern I followed for my recent 1890’s dress was wonderful. It’s a great book to have around, and you can’t beat the amount of patterns you get for the price! I’m not sure if i’m allowed to review this since I haven’t used it the way it’s intended to be used. I bought this as a visual reference for making fitted 1890’s jackets with flared skirts. 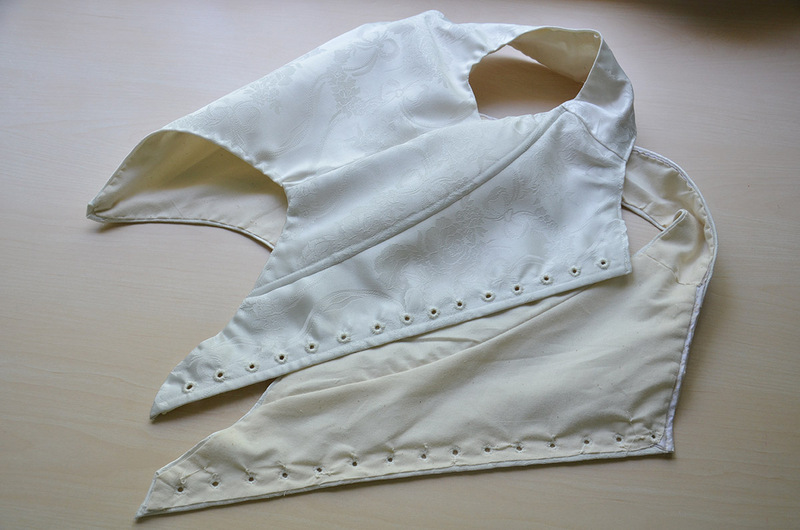 And I’ve since used it as a visual reference for how double breasted jackets and shirtwaists should look when flat…then used that as a guide when draping similar garments. But this book is intended to be a drafting manual. It includes instructions on how to measure yourself and how to create flat patterns based on those measurements. Since this is an older book, the instructions are stiff, but don’t seem very difficult to follow. After the drafting system is explained it has pages devoted to garment diagrams, and a page of drafting instructions to go along with each one. The diagrams cover everything from short fitted jackets to to double breasted riding coats with flared skirts. It also has diagrams and instructions for sleeve patterns and several shirtwaists. At the back of the book there are drawn examples of each piece. Overall, this served the purpose I bought it for. 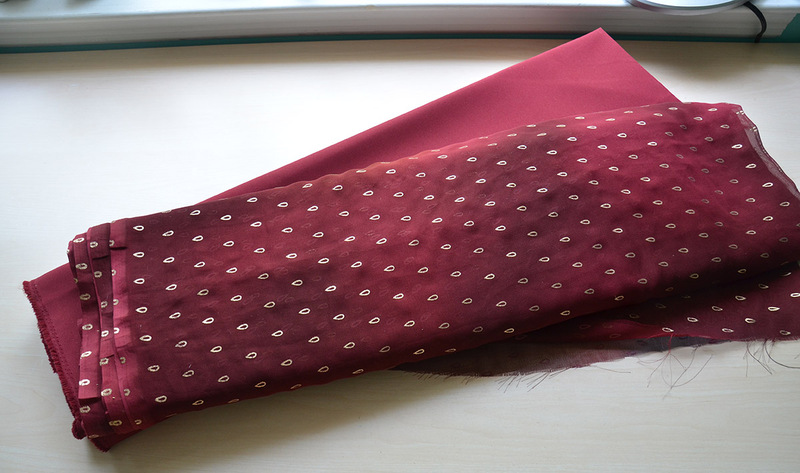 It helped me understand what lat 20th century patterns looked like flat, which helped me drape my own equivalent. But I can’t vouch for the accuracy of the instructions since I haven’t followed them! This isn’t a pattern book, but I keep it with my pattern books since I think it’s a great accompinment to them. This book has a unique format, with at least two pages devoted to each costume. Each costume is dated, with a paragraph of typed text about it. But the rest of the pages are filled with drawings and notes made by Nancy. There are a lot of unique notes and information in this book. In addition to sketches of the exterior of the costume, there are notes about the interior – how things were lined, what materials were used, where the boning was placed. How long the train was, and how much of the train was lined. Even things like the width of the fabric used, and the number of seams in a skirt are documented alongside detailed sketches. Technically things that can be learned through pattern books, but alongside the sketches it’s a lot easier to follow. Ecspecially for things like lining and closures. Seeing how the fabric drapes over the closures, along with how they looked from the interior makes it seem more approchable. In addition to dresses, shoes, petticoats, hats, and chemises are all discussed as well. Though I wouldn’t use this as a standalone reference for a costume, It’s a fantastic resource to use along side inspiration books (with lots of photos of costumes, but none of the construction) or pattern books that are hard to imagine in a three dimensional way. Those are all the construction focused/pattern books I own. Now I’m going to talk about inspiration books, which feature a lot of images of historical costumes, but very little information about the origin or interior of the garments. 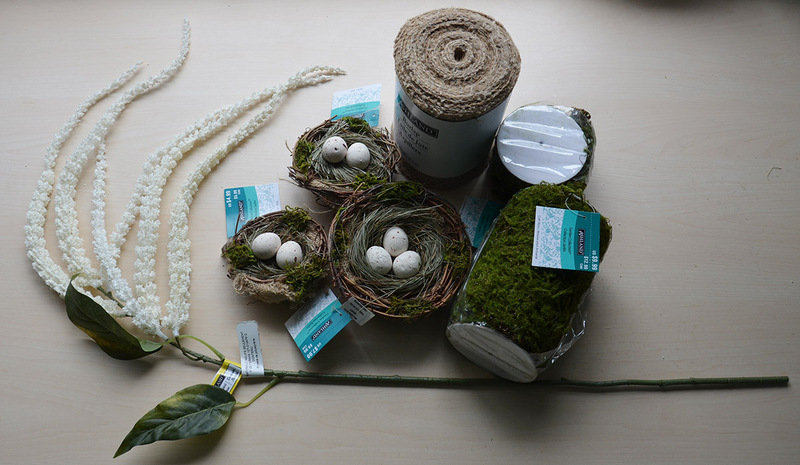 I use these when I’m not sure what to make, or when I want more references to build out a costume idea I already have. These first four are all illustrated, with no photos of costumes. I originally discovered this when I took a class and the teacher had the large copy of this book. looked through it one day and fell in love with the full color illustrations that were packed onto every page, and the huge variety of styles it included. I personally own the smaller version, which has two volumes. The first volume has the illustrations, and the second has more information about the drawings. The drawings in this book aren’t modern, they were created and researched in the 1800s, which means they aren’t the most accurate depiction of history. But the drawings are beautiful. And every time I look through the book I find something new I want to make. Unlike most books it isn’t exclusively european fashion. It has pages devoted to Egyptian times, Ancient Greece, China, Africa, and Spain. In addition to hundreds of full page color illustrations it also has drawings of furniture, architecture, weapons, instruments, and even camels. It provides a well rounded image of not just what people wore, but also what they were surrounded by. The only negative I can say about this book is that the time periods for each page aren’t labeled. They only have the country listed. Volume II does have additional information about each page, but it’s awkward switching between them. Now I know enough about historical fashion to know approximately which decade each page focuses on, but when I first got it I had no clue. Also as I said earlier, this isn’t the most accurate depiction of history. If your goal is to make historically accurate costumes you’ll need additional references. Even if you don’t want to make historically accurate costumes you’ll probably want more references since most of these drawings only show one side of the garment, and don’t delve into the details. But I love this book! Looking through it makes me happy and fills me with ideas. I would highly recommend it to anyone interested in historical fashion, regardless of whether they make costumes or not. This book is quite similar to The Complete Costume History in that it consists only of pictures. Except this book lists the date on each page in addition to the country of origin, which I like. The drawings are more detailed in this book, though there are less of them, and the pages are in black and white. The costumes plates in this book were originally researched and published in the later 1800s, so once again they aren’t the most accurate. But I still enjoy this book. When I got it I didn’t know very much about historical fashion, flipping through this gave me a good grasp on the various silhouettes and styles, how they evolved, and when they were popular. Since the information in it is limited, that means it’s easy to absorb. I’d highly recommend it to beginners, as long as they are aware that the drawings aren’t completely accurate and are willing to research the garments more on their own. I don’t think I’ve made anything based on the drawings in this book, but I do enjoy flipping through it when in search of inspiration. However I enjoy The Complete Costume History more and don’t think you need both. I think this is a great book to get along with one of the ones listed above, since it covers the major decade they miss: The mid to late 1800s. I purchased this early in the year since I was struggling to find references of garments from the 1890’s. Disappointingly, this doesn’t have a lot of pages devoted to that period. It’s far more focused on the bustle dress eras. But I’m very happy that I purchased it, since it’s made me enjoy, and respect a period of fashion I previously thought I hated. Though these fashion plates were also drawn in the mid 1800s, they are very accurate since they depict the garments that were worn during that period. This book has my favorite format of all the “Inspiration” books. 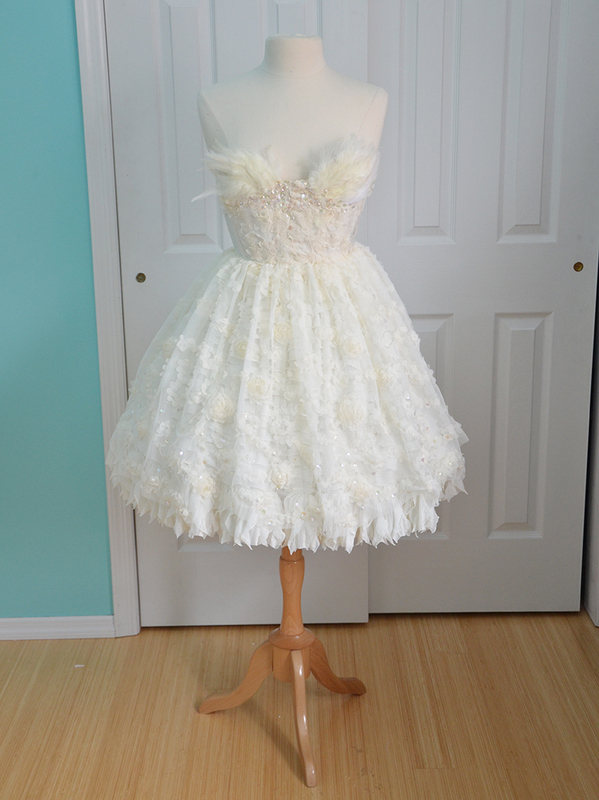 Each dress is accompanied by a short, concise paragraph that talks about the style, colors, and when it was worn. It gives you enough information to research it further on your own, and some insights into how dresses were trimmed and the fabrics used. Though the majority of the pages are devoted to full length dresses, there are many drawings of accessories. Headpieces, foundation garments, parasols, children’s clothes, shoes, and jewelry all have pages of their own. I think this would be a valuable book for anyone who appreciates historical fashion in general. I didn’t expect to like half the examples in this book since I’m not a huge fan of bustle dresses, but I still really enjoyed reading through it and seeing how the styles evolved. It’s also been a fantastic reference for several of my projects, and served as the main inspiration for a few things I currently have in progress. This is one of my most referenced books. It isn’t detailed enough to be a standalone reference on hats throughout history, but it’s a really great start and source of inspiration. I bought this when I knew very little about hats and after flipping through it once I had a basic understanding of historical hats and what periods they belong to. Even now that I know more about hats, I’ll still look through this for ideas on what to pair with ensembles I’m planning. The book has one page of numbered drawings accompanied by a page of text that explains each hat in greater detail. 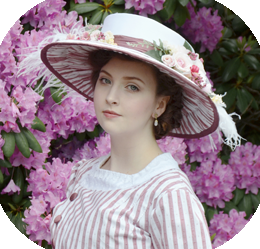 Something I like a lot about this book is that it talks about how hats evolve – it doesn’t just say “This is a flower pot hat, worn in the 1890’s” is says why they were called that and how they are different from the hats worn a few years prior. Along with how that style changed throughout the decade. The book covers a huge range of time – from 1100 all the way to 1980, with the 1700’s and 1800’s being covered with the most detail. A downside to this book is that the illustrations only show each example from one angle. The descriptions are very helpful, but short. So you don’t get enough information about each example to use them as your only reference when making a hat. The writing is also a bit blocky, and lacking line breaks between the explanations for each piece, so it isn’t enjoyable to read through in it’s entirety. I’d still highly recommend it if historical hats are something you want to learn more about. It’s taught me a lot and was my main motivation for getting into headpiece making. I think this is the prettiest book I own. And also the heaviest! It’s a two volume set of books, which as far as I know have to be purchased together. The first book shows fashion from the 18th century to the early 20th century, and the second book is entirely 20th century fashion. These books are beautifully put together, especially the first volume. I really can’t recommend the first book highly enough. The garments chosen are beautiful, and wonderfully styled and photographed. It’s incredibly inspiring to look through and made me fall in a bit more in love with historical fashion. 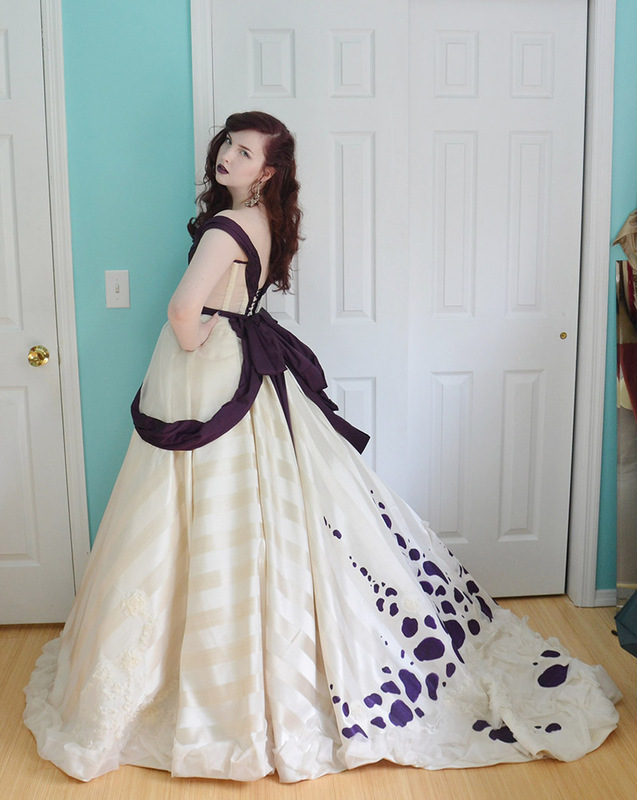 The photos mostly show the full length dresses, but there are pages devoted to the detail work and accessories. 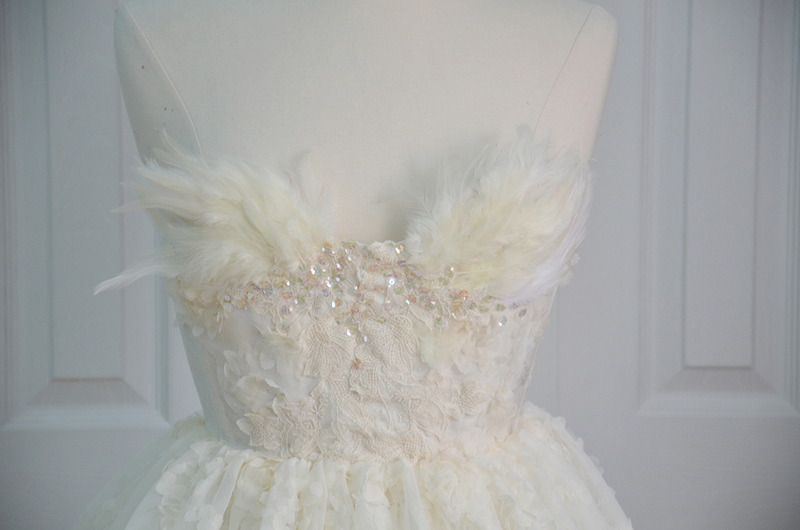 Each dress is accompanied by a very short explanation, with some having full paragraphs. Some pages have more text than others, but the real star of this book are the pictures. Most of the images are photographs, but some of them are paired with fashion plates and drawings. Overall It’s a stunning collection of garments and photos. I’ve had it for almost a year now and I still really enjoy looking through it. It would make a fantastic gift, since not only is it a great reference, it’s also pretty enough that people who don’t really “get” historical fashion can enjoy it. Volume II however…Well, it’s not my cup of tea. 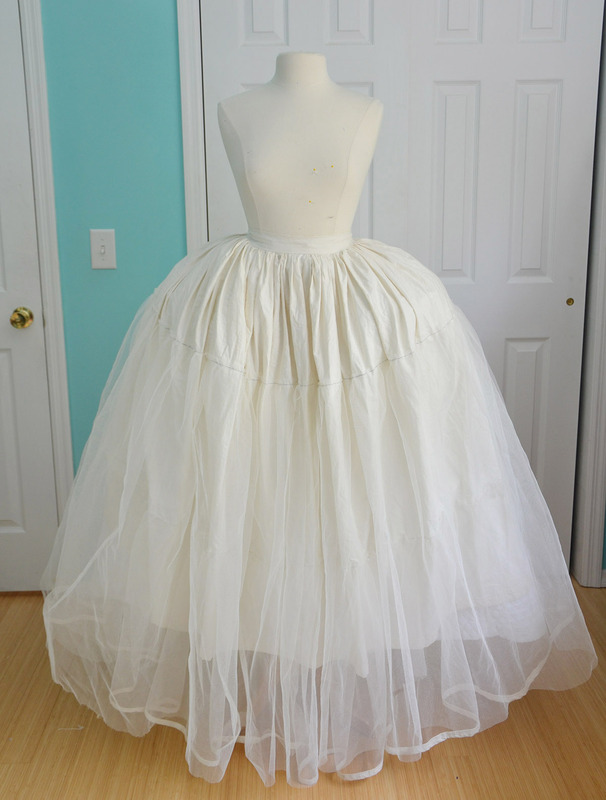 I enjoy the first portion since the 1920’s dresses are beautiful, and a lot of the dresses from the 50’s are nice too. The rest of it is a bit weird and I find the examples they chose for garments very odd. There are shoes made out of grass, dresses made from plastic, and a plethora of awkwardly shaped runway pieces. I understand that the uniqueness of these pieces are why a museum would have them in their collection, but I was disappointed by them. It didn’t feel cohesive with the tone of the first book. However if you like unusual fashion, and appreciate the more sculptural aspect of clothing you’ll probably really enjoy it. Overall I think it was worth what I paid (a little more than twenty dollars). I would pay the same amount over again for just the first book, since I think it’s fantastic. But the second book isn’t my favorite, and I wish there was an equal amount of focus given to all the periods, rather than the 20th century getting a volume of its own, with the prior two hundred and fifty years compacted into one. More examples of fashion from the 1800’s and turn of the century would have made it a lot more enjoyable for me personally. Speaking of pretty books, this one is a beauty! I purchased this as a visual reference since I wanted more examples of Elizabethan and mid 17th century fashion in my collection, something this book is filled with. 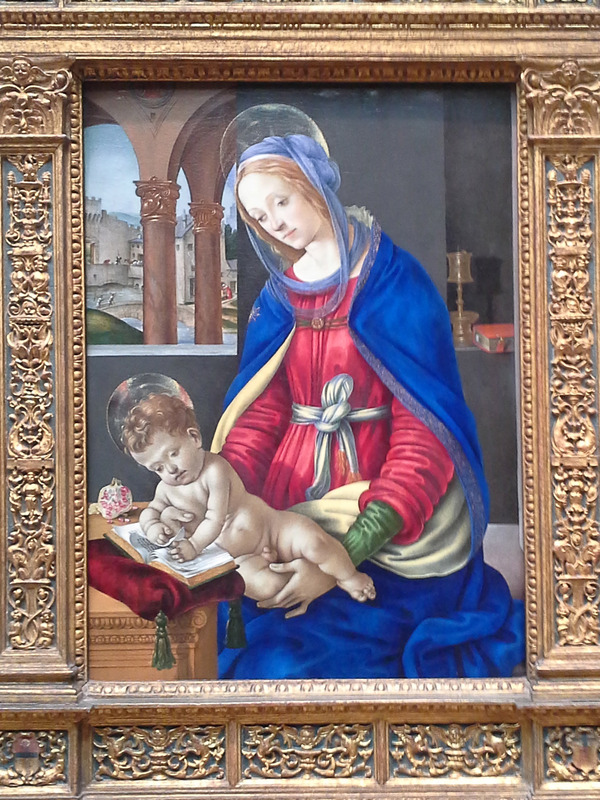 Every page has at least one painting printed on it, and almost a quarter of the pages are taken up entirely by prints. This book really focuses on the details, often cropping paintings to highlight the embellishment or textures used on the garments. 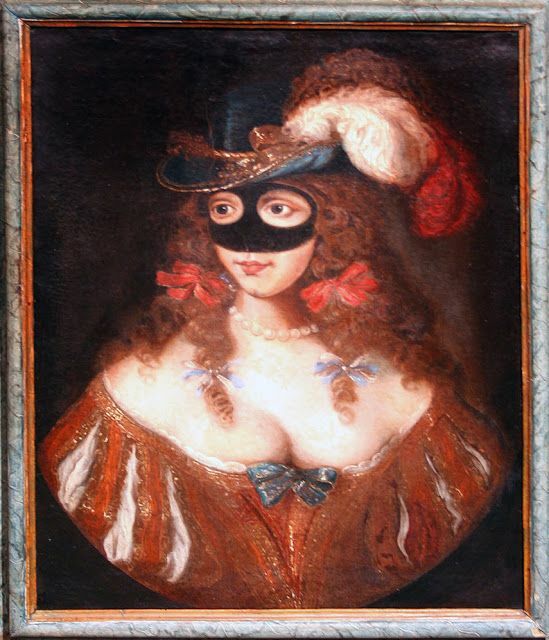 It also pairs paintings with photographs of similar items to what’s worn in them. For example a chemise with blackwork embroidery is on the page across from a tudor portrait of a woman wearing a blackwork embroidered partlet. Even though the real star of this book is the artwork, there is a lot of text too. Far more than I had expected. To be honest I haven’t read a lot of it, since I purchased it primarily as a visual reference. What I have read was well written, but not especially captivating. My only peeve with this book is the formatting. Large portions of pages are often left blank because of photo placement, ands sentences run on between several pages. For example “The embroidered waistcoat is clearly decorated in a similar manner to a waistcoat in the Fashion Museum, Bath. Wheras” – that sentence continues three pages later. It seems poorly planned. Another note is that this book is divided into chapters such as: Dressing Children, Dressing Men, Dressing Women, Painting Dress, Dressing Across the Borders, etc. This is nice because it means all the examples within a chapter are relatively cohesive, since they have the same theme. I’m sure that makes it nicer to read too. But I’m used to historical fashion books being sorted by date, with the earliest examples at the beginning. And in this they are scattered all over within the chapters. From the perspective of someone trying to use it as a reference, it can be difficult finding what I’m looking for. It usually means I have to look through the entire book to find anything – but it’s a beautiful book, so that’s usually a treat more than anything else! Overall I love looking through it and the examples they chose to include. They never cease to inspire me. It’s visually pleasing from the outside too, and would be a nice coffee table book in addition to being a wonderful reference. I think out of all the books I own, this one has the most “complete” coverage of historical fashion. It begins with prehistoric fashion before moving into things from the early third millennium. Egyptian artwork and how it depicts costumes has two chapters of its own – and so do many other periods that don’t fit into most historical fashion books. I reach for this when working on medieval projects, since it has far more examples of artwork from the 1000-1200s than any other book I own. 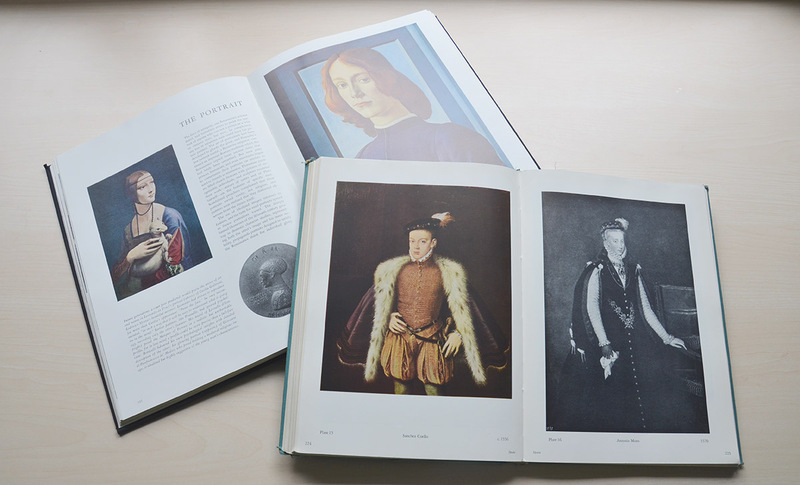 The book is quite text heavy, but every page is dotted with pictures that help give you a sense of the period. I’m not a huge fan of how this is written, it’s readable and interesting but not compelling. My attempts to read it from cover to cover have been squashed, but I do enjoy reading pages related to what I’m currently working on. 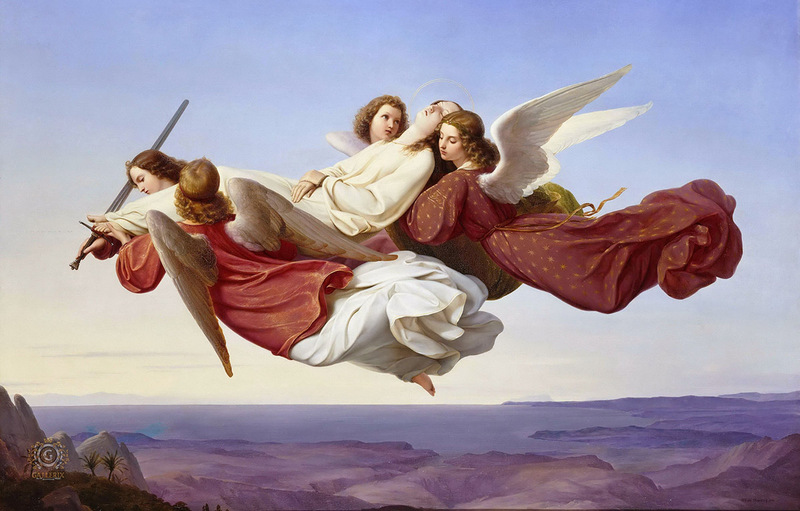 The pictures are a mixture of paintings, fashion plates, sculpture tapestries, and photographs. To get inspired I always flip to the pages about the period I’m planning on making something from. Though the pictures aren’t as pretty as other books, they pick a lot of unique examples that differ from what you usually see on pinterest. It’s a book I’m very happy to have in my collection, but probably not one I would recommend as a gift since it isn’t as immediately exciting as the others. I have one technique focused book to talk about and then I’m done! This is called The Art of Manipulating Fabric by Colette Wolff . The cover caught my eye when I was browsing, and the reviews won me over. I don’t use this book very often, but it’s fascinating. Each page describes multiple techniques and has instructions on how to do them. The instructions are usually paired with diagrams that show the steps. 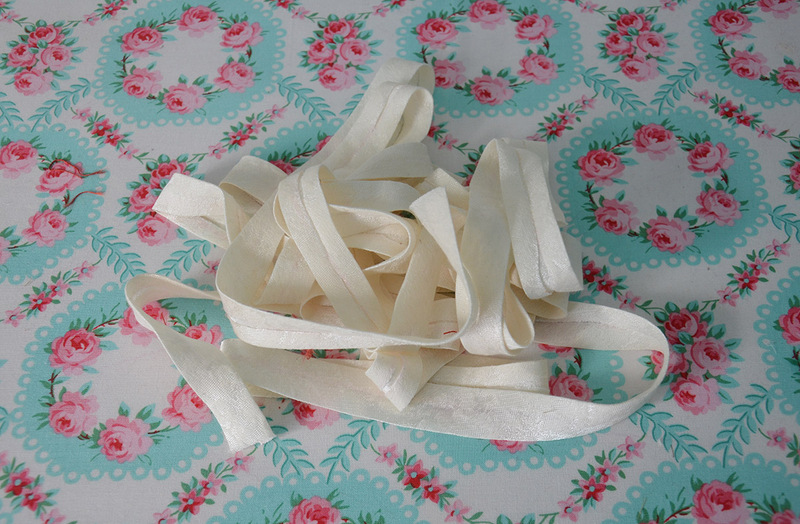 It begins with basic things, like making ruffles. Then moves onto similar, but more elaborate things that use the same techniques, like fluting and furrowing. It also has picture examples of everything – including gathering examples that show the fullness of of fabric when it’s gathered to be one half, one third, or one quarter of it’s original length. 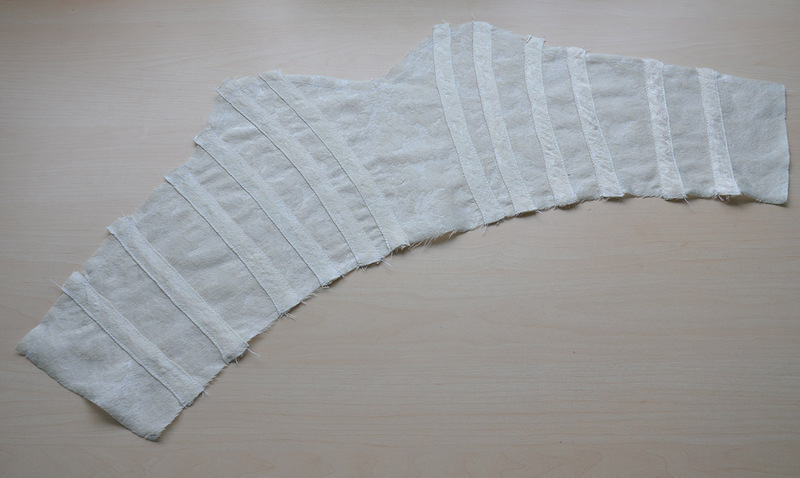 The techniques get more complicated as the book goes on, but still cover basics like shirring, godets, pleating, and making simples flounces. A lot of the examples go far beyond the level of patience I have, but it’s still neat to see instructions about them, and how they look executed perfectly in the examples. It’s an interesting book to have, regardless of your skill level. 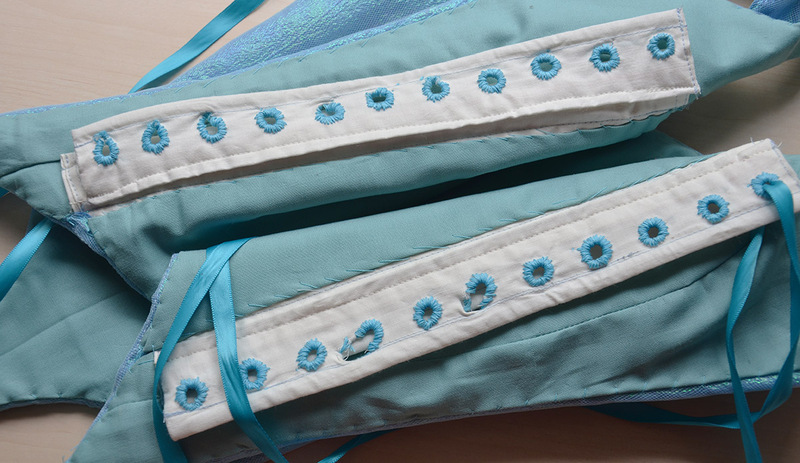 Since it covers the basics it can work for beginners, and I guarantee that no matter how long you’ve been sewing there will be something in here you’ve never seen before. Authentic Victorian Dressmaking Techniques – I’ve referenced this for specific projects a few times, but haven’t read it from cover to cover. So far I like it and how they touch on things not usually mentioned in modern sewing manuals. 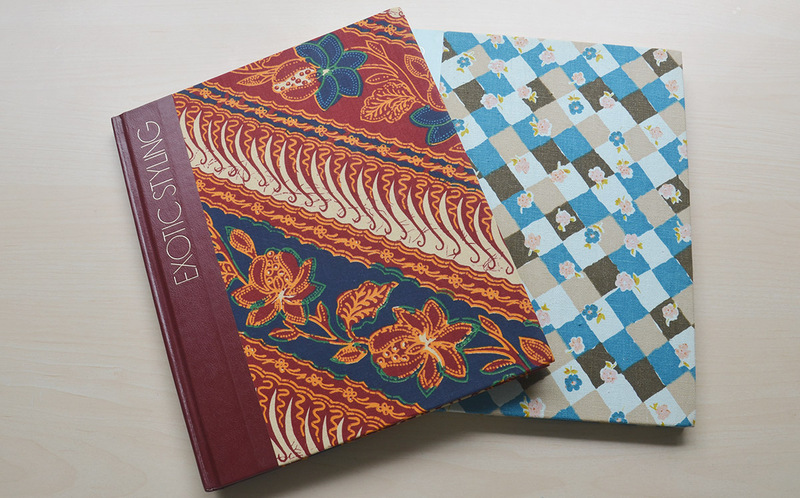 The Art of Sewing Books – I got these at a vintage book store. I like the way they are laid out and the diagrams but they aren’t relevant to what I’m currently doing so I haven’t read them. Women’s Institute of Domestic Arts and Sciences manuals/textbooks – My Great Aunt gave me these and they are wonderful. I love the way things are explained and the huge variety of techniques. If you can find them I’d highly recommend them, they are really useful and also a piece of a history since they were printed in the 1920s! That’s it for reviews! I hope you enjoyed this and found it helpful. It would be nice if the comments were a bit of a discussion – are there any historical costume books you would recommend? Any I liked you that didn’t? Ones on your wish list? I’m hoping to get “Fashion Victims: Dress at the Court of Louis XVI and Marie-Antoinette” for Christmas and am keeping my eye on “Art Nouveau Fashion” – I want more picture books! Though I used amazon links in this post, remember to look around for better deals! A few of these were purchased from Barnes and Noble since they were cheaper there AND had $10 off coupons for Black Friday. A fifty dollar book on amazon cost me $28 with free shipping from B&N. Book prices also change all the time, so if something is too expensive keep checking back – I’ve seen prices drop from $55 to $38 in a day. I think that’s all I have to say for today, thanks for reading and I hope you have a nice Thanksgiving – or if you don’t celebrate, then a really fantastic week in general! This post is about making a pair of shoes. Yup. That is a thing that I decided to do. I don’t know if I can really call them shoes, since they have the flexibility and appearance of slippers, but they were supposed to be shoes. And I don’t think they look too bad considering this is my first attempt at making a pair! I needed shoes to wear with my Cotehardie ensemble (post about making the cotehardie is here). I looked around online and couldn’t find ones in my price range. Even the really inaccurate, modern boots from DSW were double what I wanted to spend. So I decided to make a pair from wool I had leftover from making the mantle (post about that should be up soon). Before getting into this I feel I should mention that I had no idea what I was going. And that I know nothing about making shoes. I didn’t spend a lot of (read: any) time researching what the process should be. I made it up as I went along. But I did find a really amazing resource for medieval footwear! This is the site. I didn’t read through their construction guide, or use any of their patterns, but found the images very helpful. It was a fantastic starting point for figuring out what my boots should look like. I ended up combing the Side Lacing Boot and the Peaked Shoe. For the soles of the shoes I used some embossed pleather from my stash and the cheapest shoe inserts I could find at target. The blue fabric is leftover heavy wool coating. I ended up using some spandex, wool suiting, and embroidery floss as well but those things aren’t pictured. 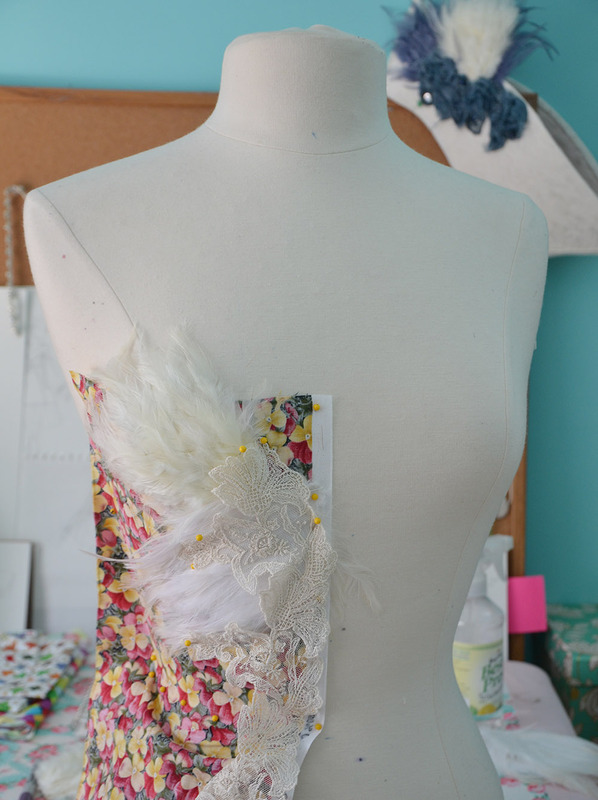 For the pattern drafting process I used newsprint, cardboard, tape, and a plastic bag. To figure out the shape of the sole I traced the outline of my foot onto the cardboard. Then I made the end super pointy. According to this article, in the 1300s the point was usually only extended by 10% of the foots length. But I have big feet. And I always stay away from pointed toe shoes since they make my already large feet look like clown feet. And I didn’t want that to happen here. So I decided to make the point really long with hopes that it would look very exaggerated, instead of making my feet look huge. I think it worked. Kind of. I cut out the sole pattern and traced it onto the fake leather. And onto my cushion soles that I bought from target. Unfortunately these weren’t big enough to accommodate the pointy toe. To combat that I fused felt weight interfacing onto the tip of the fake pleather, so the point would keep it’s shape. All that was set aside for a bit while I focused on making the shoe pattern. The first step in doing this was taping the cardboard sole pattern onto the bottom of my foot. Then I taped crumpled plastic bags overtop of it so the exaggerated toe had to some shape to it instead of being completely flat. Then another plastic bag went over my entire foot and I wrapped painters tape around everything until I had the shape I wanted. I marked a seam line around the ankle, the centerline, where the sole ended, and the side line where I wanted the lacing to be. I also drew the shape I wanted the top of the shoe have. Then I cut the bag off my leg, fixed up the wonky guidelines, and cut it into two pieces. I traced that onto paper and bam, a pattern! The only major change was that I added seam allowances. I cut the shoes out from wool and sewed the pieces together. 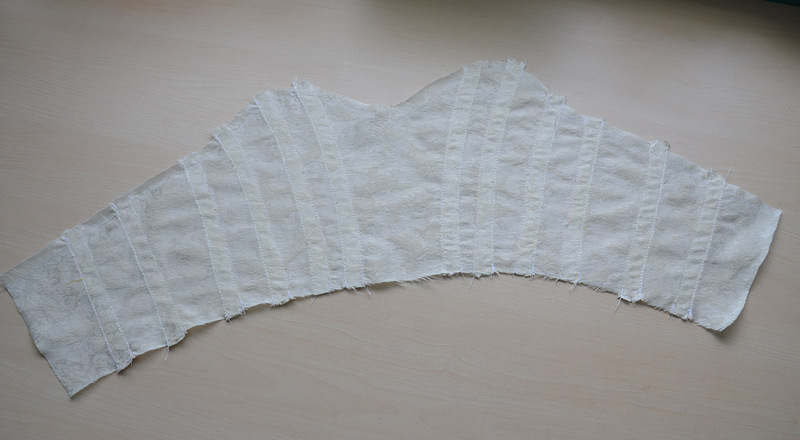 Then sewed around each edge to create guidelines where the fabric should be turned under. All the edges were turned under at the stitch line and sewn in place with a running stitch. I did this by hand so the stitching wouldn’t be too obvious. Switching back to the soles, I placed the pleather layer beneath the cushion sole. Then covered them with a wool suiting, so the bottoms looked pretty. I also cut out a layer of gold spandex, which will be used as a top layer for the soles. I figured this would wipe down well in case the shoes get sweaty inside. 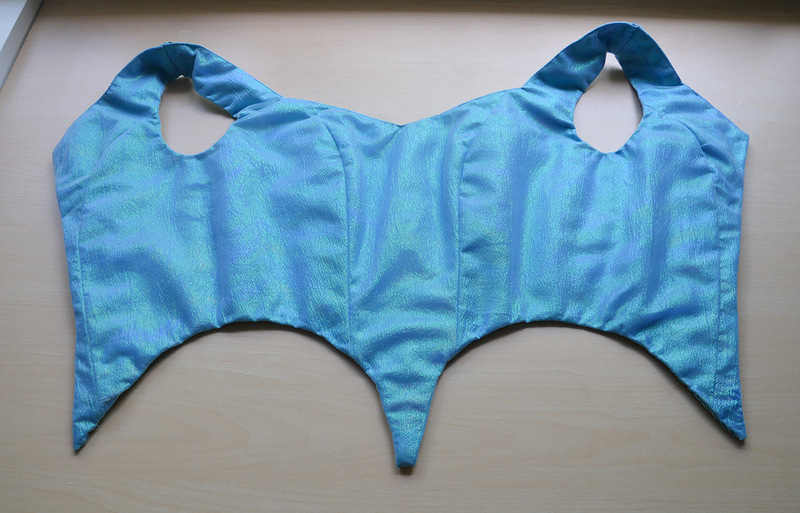 I used basting stitches to sew the spandex on after the soles were covered with suiting. Then I sewed eyelets into the sides of both shoes. I did this by hand with three strands of embroidery floss. 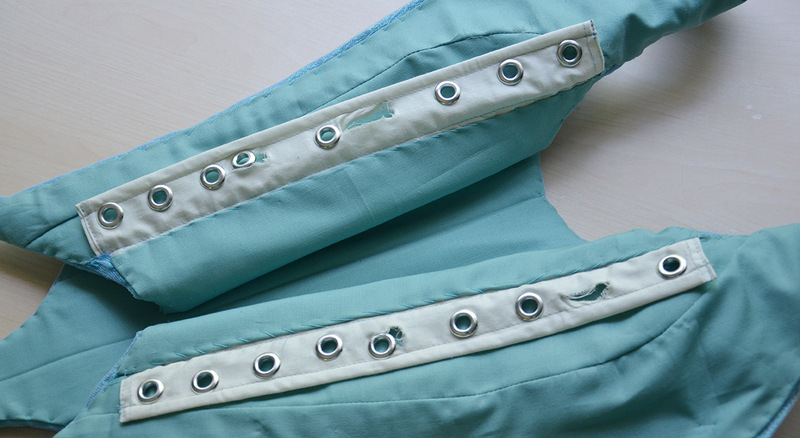 The bottom inch of the side edge (that doesn’t have eyelets) was sewn shut by hand. Then I pinned the top part of the shoes onto the soles and sewed them on by hand. And that was it! They are done! Stuff I learned: The sole should be slightly more narrow than your foot. Mine ended up being a lot wider than they needed to be. But I would rather that be the case than them being too small! And using anything other than leather will probably result in the shoes looking like slippers. Oops. Also – i’m fully aware these aren’t very practical. They definitely aren’t waterproof and have no traction. There also isn’t topstitching around where the top of the shoes meets the sole, so I doubt they will be very durable. I’m going to wear these for a few sets of photos, not to an event that requires a lot of walking so it isn’t a big issue for me. But you could definitely use a similar process, with rubber soles and leather that would be more appropriate for heavy wear. Here they are worn with the cotehardie and tights! A write up on making the mantle and a tutorial on the crown will be coming up soon. As for the leggings, I’ll include that info here because they were really easy to make. I used a pair of forever 21 leggings as a guide, then added several inches to the waist and ankles since my fabric was one way stretch (and the leggings I based them on were made from two way stretch knit). Folded the hem inward by a half inch, twice, and hand sewed it down. Then turned the top edge inward by a half inch, then by two inches, and sewed across the bottom to create a channel for elastic. I sewed the elastic in and that was it! 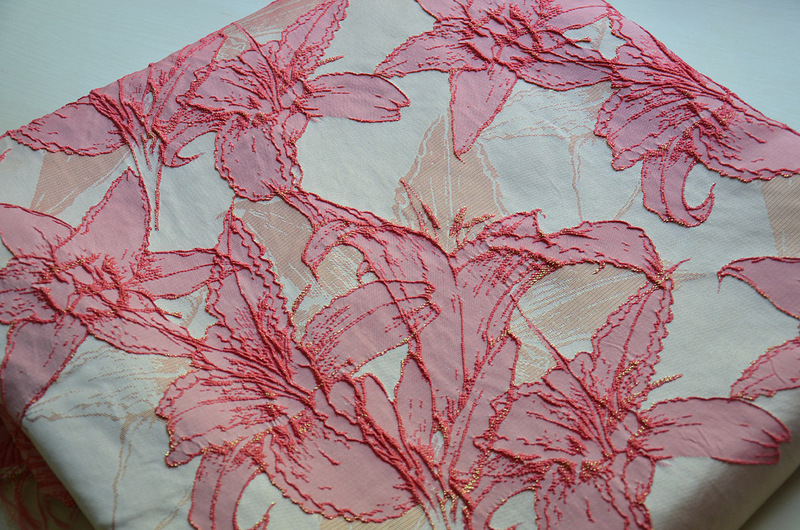 This fabric looks very flesh toned in the photos above but it has a pretty gold sheen to it which should come to life when I photograph this outdoors. And that’s it for this blog post! Thanks for reading and I hope your New Year is off to a good start!